Yesterday, a dear friend of mine, an Orthodox Christian -- husband, father, and physician serving in the U.S. military in the Balkans -- shared with me his powerful experience of the Rosary of the Blessed Virgin Mary during this Great Lent. (Orthodox Pascha falls on May 5th this year. Orthodox Christians are, therefore, still in the compunctionate labours of Great Lent.) Yes, some Orthodox Christians do pray a version of the Holy Rosary of the Mother of God. One form of the Holy Rosary, promoted by none other than Saint Seraphim of Sarov, incorporates fifteen mysteries; each mystery being meditated during ten Angelic Salutations. I forgot to give you a piece of advice vital for salvation. Say the O Hail, Mother of God and Virgin one hundred and fifty times, and this prayer will lead you on the way to salvation. This rule was given by the Mother of God herself in about the eighth century, and at one time all Christians fulfilled it. We Orthodox have forgotten about it, and St. Seraphim has reminded me of this Rule. In my hands I have a hand-written book from the cell of St. Seraphim, containing a description of the many miracles which took place through praying to the Mother of God and especially through saying one hundred and fifty times the O Hail, Mother of God and Virgin. If, being unaccustomed to it, it is difficult to master one hundred and fifty repetitions daily, say it fifty times at first. After every ten repetitions say the Our Father once and Open unto us the doors of thy loving-kindness. Whomever he spoke to about this miracle-working Rule remained grateful to him. Make no mistake about it: the Holy Rosary is a prayer that heals the deepest wounds and traumas. In the Rosary, the Mother of God presents us to Christ, the Physician of our souls and bodies, who touches us through the grace of His mysteries. In the Rosary, Christ, the Physician of our souls and bodies presents us to the Mother of God; He entrusts us to her maternal Heart. Certain deliverances from habitual sin, and certain healings come only through the Immaculate Virgin Mary. Why? Simply because it pleases God that it should be so. 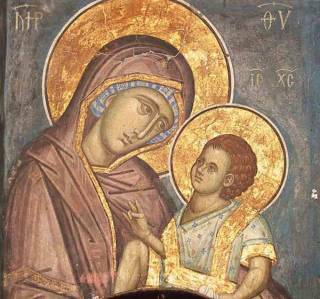 As Orthodox Christians enter into the radiant brightness of Pascha, Western Christians will be entering into Mary's month, the month of Mary. What better time to take up our beads and, with Mary, enter into the healing, illuminating, and deifying mysteries of Christ? + In the name of the Father and of the Son and of the Holy Spirit. Amen. Glory to the Father, and to the Son, and to the Holy Spirit, both now and ever, and unto the ages of ages. and the Mother of our God. True Theotokos we magnify you!